Published April 4, 2016 at 2564 × 1673 in Portfolio. 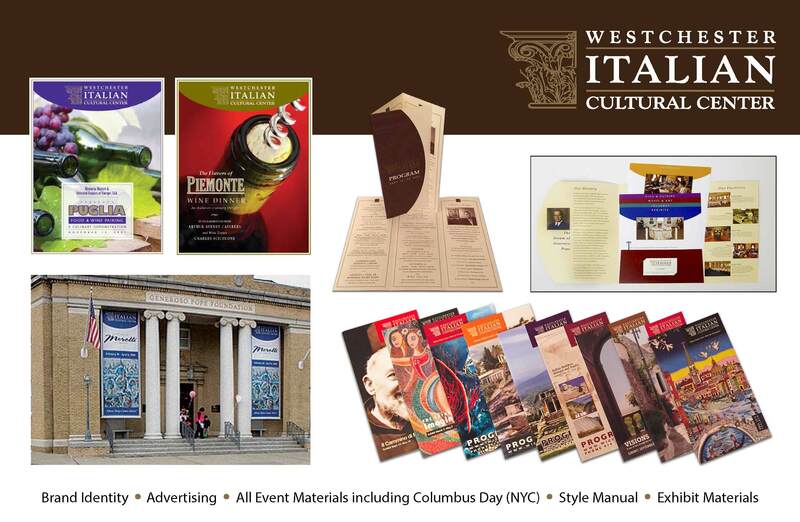 Westchester Italian Cultural Center wanted us to create a new logo and style guide. We were also asked to create materials for a grand opening event, including a large folder/brochure, invitations for various events, forms, banners, premiums, custom certi-ficates, catalogs, advertising, and a newsletter. We used the architecture of the turn-of-the-century building that houses the Westchester Italian Cultural Center as a theme. Once the style and colors were approved, we re-designed the style guide and all graphics with the same look for consistency with the group’s heritage and message. The grand opening was a success, with many Westchester politicians, movers and shakers from the Italian community, and the Italian ambassador attending the various events for the weekend-long opening. Membership and donations were high.